You are not alone… Help is just a phone call away. The mission of the Adelphi New York Statewide Breast Cancer Hotline and Support Program is to educate, support, empower, and advocate for breast cancer patients, professionals, and the community. Today a woman born in the United States has a 1 in 8 chance of developing invasive breast cancer during her lifetime. In New York State approximately 14,028 women will be diagnosed with breast cancer this year. 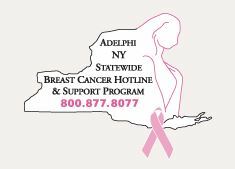 The Adelphi New York Statewide Breast Cancer Hotline & Support Program is here to make sure that no person affected by breast cancer has to face it alone. We are here to provide you with the information and support that you may need. We are here to answer your questions. We are here to provide you with someone to talk to who understands what you are going through. We are here to guide you to resources that may help you, in the community you live in. We are here to support and empower you to make the decisions that are right for you. We are here for you. SERVICES WE PROVIDE – All services are free and confidential. THE HOTLINE: Call the Breast Cancer Hotline anytime at 800-877-8077. The women who answer the phone at our hotline are mostly breast cancer survivors. These volunteers have “been there” and are ready to offer support and information. They are there for you and you may call as often as you wish and talk for as long as you need to. We can also match you up with survivors who are going through the same type of treatment as you are. Breast cancer can cause many feelings to emerge, such as shock, confusion, fear, sadness anger and uncertainty. Our support groups provide the opportunity for participants to share their feelings and experiences with the guidance of social workers and social work interns. Talk with someone to help you cope better with your diagnosis. Individual and family counseling is provided by our social workers and masters level social work interns. Individual telephone counseling is available statewide. Our public forums offer the latest information on breast cancer. Panelists consist of the top professionals in their fields. Past topics have included new treatment options, legal rights, breast reconstruction, breast cancer and fertility and medical updates. All forums are free and open to the public. Sisters United in Health/Hermanas Unidas en la Salud (SUIH) is a not-for profit collaboration of organizations in the Long Island region. Our goal is to provide breast health education, conduct outreach initiatives and offer screening and support resources to African-American and Latino women in underserved communities. Our volunteers and community educators are available at no cost to provide breast health education at community events such as church meetings, health fairs, women’s groups and other forums.